externally with a single resistor. The built-in thermal regulation facilitates charging with maximum power without risk of overheating. The EMC5755 always preconditions the battery with 1/10 of the programmed charge current at the beginning of a charge cycle, until 40μs after it verifies that the battery can be fast-charged. The EMC5755 automatically terminates the charge cycle when the charge current drops to 1/10th the programmed value after the final float voltage is reached. The EMC5755 consumes zero reverse current from the battery at standby, shutdown and sleep modes. This feature reduces the charge and discharge cycles on the battery, further prolonging the battery life. 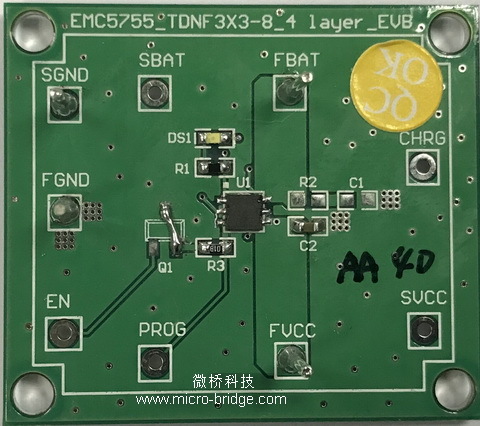 The EMC5755 can also be used as a LDO when battery is removed. Other features include shutdown mode, charge current monitor, under voltage lockout, automatic recharge and status indicator.